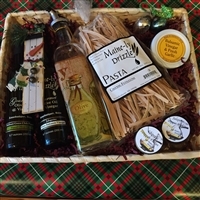 Beautifully packaged basket includes one 6.7 oz Baklouti Fused (Agrumato) Green Chili Olive Oil ~ HOT*** a 6.7 oz Jalapeno White Balsamic Vinegar, Cayenne Pepper Fettuccine Gourmet Fresh Dried Pasta, Fox More Than A Mustard, Chipotle Pepper Flakes Spice, Jalapeno Pepper Flakes Spice as well as included is a really pretty olive Oil dispenser. All these products are packaged for the hot person in your life. Beautifully packaged wicker basket includes one 6.7 oz Blood Orange Extra Virgin Olive Oil, a 6.7 oz Dark Chocolate Balsamic Vinegar , Chocolate Fettuccine Gourmet Fresh Dried Pasta- Chocolate Sweet Topping Gourmet Pasta Sauce Mix , Hot Fudge and Salted Caramel Sauces from COOP'S - Coop's Handmade Hot Fudge is a winner of a coveted sofi™ award by the Specialty Food Association. Coop's Handmade Salted Caramel also won a sofi™award - and was featured on the TODAY show July 24, 2015. 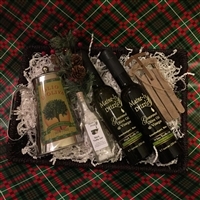 All of these products are packaged in an awesome basket that is sure to please. 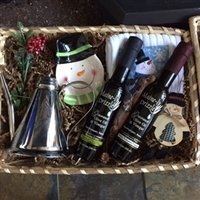 Beautifully packaged basket includes one 6.7 oz White Truffle Olive Oil a 6.7 oz Black Truffle Olive Oil, Black Truffle Sea Salt and a Stainless Steel Oil Can.